It's nothing but work central over here at Team Baker right now - I've totally neglected my blog duties due to a mountain of (seemingly never ending!) paperwork and all of this added extra cleaning up I'm doing makes for not a fun blogger at all. But I suppose it will be very worth it in the end and naturally it all comes hand-in-hand with embarking on a new career path and then deciding to have house walls chopped up, hacked into and then pulled down doesn't it. But doing it all on top of the normal day-to-day things forever going on, plus having a two year old who now spends hours upon hours at bedtime taking apart our bedroom every night before passing out on a mountain of teddies (don't ever wish for the transition time from cot to toddler bed people - never...) - it's exhausting. And I need some fun. Free time really is amazing. Now, when I look back at our pre-Willow days I can see that we really did do a whole lot with Charlie and our free time - there was a different pantomime every year and we have watched so many book-favourite theatre adaptation shows - it was fabulous and, although Willow's inability to sit still for longer than a few minutes does worry me more than slightly, I think I'm ready to delve into that world again. 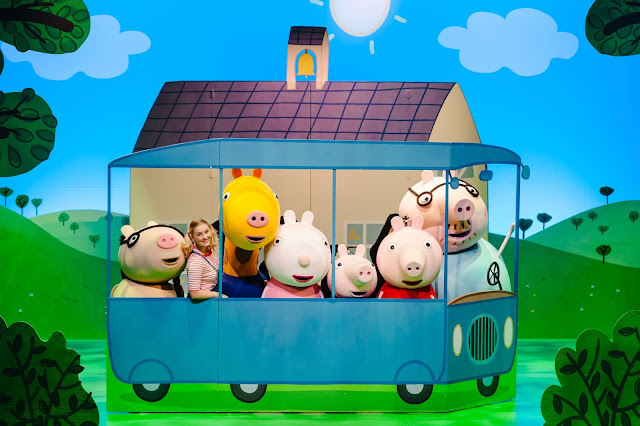 I mean how brilliant - Peppa Pig has been our go-to TV show since, well, since day one with Willow really and Charlie was a huge fan too back in his tiny-person day, so to say I'm excited about this is a slight understatement. The show is bookable now and is on on Wednesday 20th June and Thursday 21st June at 10am and 4pm at The Victoria Theatre in Halifax, West Yorkshire.